Hans Ulrich Obrist, curator and art historian, on Etel Adnan’s folding books. GB Tell me what you’ve chosen and why you chose it. HUO Etel Adnan is an artist who is in her late 80s now who works with drawing and watercolour and poetry, plays and novels and she links all the different things she does – there is a link to our sensibility to identity – it’s as though she’s inhabiting different rooms. But the room I find most beautiful is her work on these long Japanese folding books which combine drawings and handwriting. Adnan was born in 1925 in Beirut but went to the Sorbonne and studied philosophy. She has always been interested in the immediate beauty of colour in her painting. She also started to make tapestries in California. In the 60s she went away from abstract forms and started to mix her drawings with poetry and writing. Another beautiful moment was when she discovered Mount Tamalpais, which she calls her best friend and through this she explores links between nature and art. In a way, what is so fascinating about her and what makes her one of the most inspiring people I’ve ever met, is that I’m always struck by her energy and the amazing optimism of her work. I think we need optimism now. These Japanese folding books are full of pure energy and give out this courage. You see these books and they are tiny little books but then you unfold them and they’re four or five metres long. So she doesn’t colonise space like a big artwork that takes a lot of wall space. You can just fold it together again and put it on the shelf. I think that’s part of the extraordinary beauty of her work. But the beauty is not just in the colour, the energy, the dimension of her drawings but also in her handwriting. Handwriting for me is something very beautiful and it’s endangered. It’s in danger of extinction. There is so much in danger of extinction, not just animals but through globalisation we face the extinction of cultural phenomena. Many languages are disappearing. I love to see variety and I launched a protest against the disappearance of handwriting that was inspired by these Japanese folding books. This is why there is so much handwriting on my Instagram account. So for me she has been an encouragement for years and is one of the greatest artists of our time. GB What language does she write in? HUO Mostly English, French and Arabic. She speaks many languages. GB Would you say that the optimism you notice here is a rare thing? Do you see it much in contemporary art? HUO I believe that art is the greatest form of hope. But what makes Etel so special is that in her literature she also talks about many dark matters, about the war and Lebanon and connecting that to what is happening in Syria today. But her artworks emanate this optimism and positivity. GB You’ve worked with other artists from her generation such as Gerhard Richter. Do you find they share this optimism? HUO I see optimism in the very young generation too but there’s something very wonderful about the freedom of artists when they reach old age. They’re just very free. Etel is working in so many different dimensions. She writes about natural phenomena and the seasons, she writes her novels and her plays, she writes political journalism, she’s a painter, she draws very regularly, makes these folding books, she works on public art, she works with architecture and she makes these incredible tapestries and textiles. GB It seems as though she’s not focused at all on the commercial, because she works so broadly. Does that give her work a certain purity? HUO Yes, her work has this great spirit of independence. GB Do you tend to find more beauty in work that crosses different disciplines? HUO Yes, I’ve always been interested in people and movements like Dada that link poetry, literature and art – a spirit that goes beyond national or geographic or disciplinary boundaries. GB So if you find something visually appealing, is it more beautiful to you if it has an intellectual side? HUO It’s a combination ; shape, colour, form, content! GB Which factors might determine whether you think an artwork is any good or not? HUO As Edgar Allan Poe said, there is no exquisite beauty without some strangeness in the proportion. GB Is beauty always immediate for you or can it grow on you over time? HUO With time, beauty grows inwards. GB Do you believe in universal beauty? 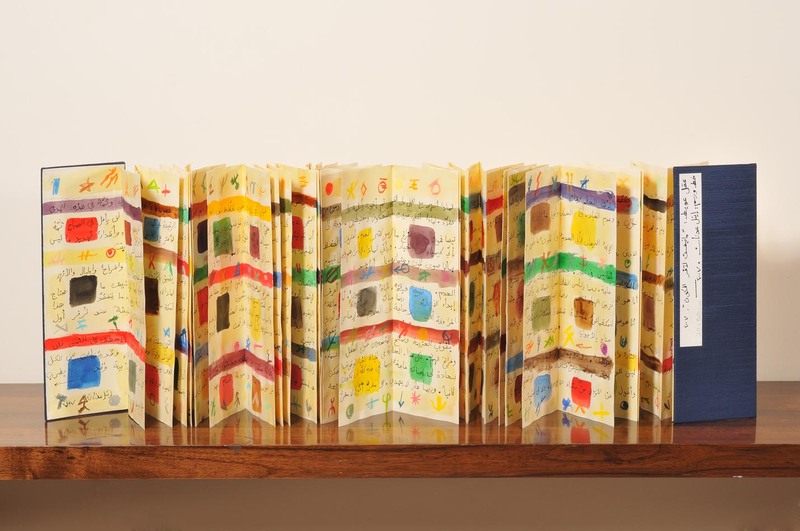 Do you think Etel Adnan’s folding books are universally beautiful? HUO In Adnan’s work the universal is linked to the particular and that relation is contingent.